Why Choose Onfit To Prepare For A Successful Fitness Career? The ‘entrepreneurial’ approach to learning we offer at Onfit virtually means that after you graduate, you’ll be in higher demand with visibly sharper skills and significantly more high-quality clients than your competitors. 1) We are the experts in Online Fitness Education. At Onfit we have two true loves…Online Education & the Fitness Industry. We are passionate about ensuring that our courses provide the highest quality technical and practical information, optimised in the easiest and most enjoyable format for you to learn. 2) We deliver comprehensive support, on your terms. Our exclusive ‘Circle of Support’ program is designed to aid easy study. It allows you to receive assistance when and how you need, whether that be through a screen share session or contacting us after hours or on weekends. The bottom line is our team is dedicated to helping you succeed and we’re with you every step of the way! 3) We Provide the ‘Whole Business’ Edge — We equip you with the tools and business savvy you’ll need to become profitable and in-demand for the long-term. We focus on providing you with what you need to excel in your chosen career, including career advice, marketing and financial resources. At Onfit, we have one mission… to help you build a rewarding fitness career. It’s our time-tested, “whole package” learning system that makes this possible. We use a simple, user-friendly path to aid fast and enjoyable learning… Our online fitness courses have been custom designed from the ground by industry professionals to ensure accurate learning presented in a fun, interesting format. You won’t just become a trainer, you’ll have what it takes to become a business owner…our training includes extensive and valuable lessons on how to turn your skills into a lucrative career – even if you only work part-time! Receive fanatical support, guaranteed. When you choose Onfit, you get instant access to our powerful support network, extending from our Career Advisor team to our passionate team of Tutors and Admin & IT Support staff. You’ll have our team at your disposal from the word ‘go’! Learn from Instructors who walk the walk… all of our Onfit tutors have worked or currently work in the field and want to share their experience with you. Not only have they been certified as trainers, but also as effective educators. They are well-equipped to help you launch a successful and rewarding career because they’ve all done it themselves. Learn on your schedule… As a pioneer of online education, Onfit leads the way in offering highly flexible learning solutions. Study anywhere, anytime with our online fitness courses. They’re compatible with all laptops and portable devices and the downloaded app allows you to study offline. Building your dream career has never been so easy. Nationally recognised, quality education… Onfit is a Registered Training Organisation (RTO #32107) and our high-quality coursework is nationally recognised across all of Australia and also Internationally. 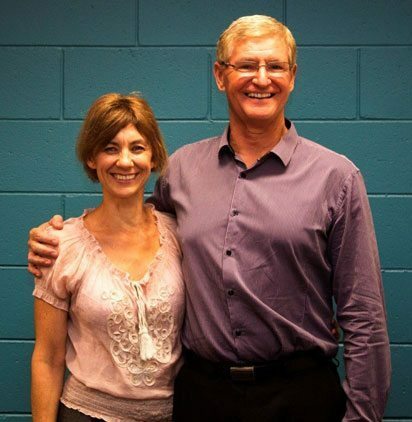 Don and Rhonda Bacchi, founders and owners of Onfit Training College, bring over 50 years’ experience within the fitness industry, including fitness and aerobics instruction, gym management, owning a personal training studio and working with the disabled. Onfit was born in 2009, when Don and Rhonda decided to share their vast experience and their love of the industry with those seeking to become successful personal trainers. They quickly realised that other online fitness courses were lacking in key areas such as accurate technical training and personal marketing skills. With their five decades of experience and unrivalled passion for the industry, they saw an opportunity to guide the next generation of trainers to build successful, long-term and rewarding careers in the Fitness Industry. Since then, Onfit Training College has established itself as an industry leader in education and innovation.